Hang tight, your file is being uploaded and analyzed! Build and Search Threat Feeds. hashdd aims to help analysts make convictions faster by joining datasets and presenting them in an easy way. Create an indicator feed using status update style formatting, then compare your findings to others. Check out our example feeds. Use third-party APIs for a quick determination on indicators without writing a line a code. Set up your API keys here. Subscribe and ingest feeds or use our free extensions to block threats. API Keys are FREE with registration! Just click Sign In to get one! What Hash type is best to lookup? hashdd supports lots of different hash types, however sometimes third party data isn't as robust. Becuase of this, we recommend searching by MD5. Are "Known Good" things included too? Yes! hashdd started as a Known Good database! We've pulled in NSRL data, spent countless hours profiling operating system and software package installations so you can tell if what you're looking at is a good or bad! Yes! 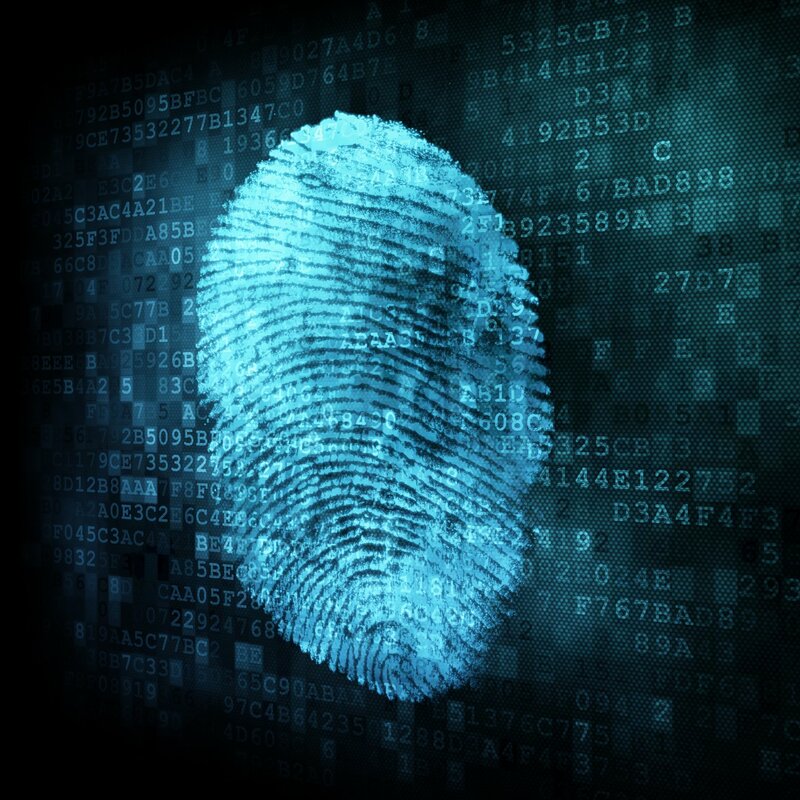 Authenticated users can download any files with a bad intent. This includes user-uploaded files that the community has decided are bad (negative votes). The download button will be shown for all hashes, however the button will only be functional for bad ones. 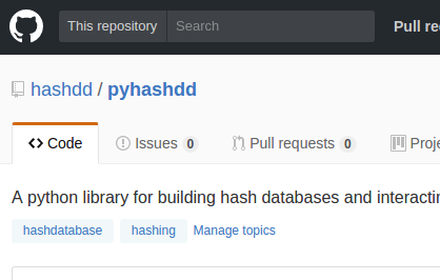 At hashdd's core is pyhashdd, a killer Python library for profiling files and building hash databases. You can use pyhashdd as a command line tool or a python import to make your own hashdd, or query our API. 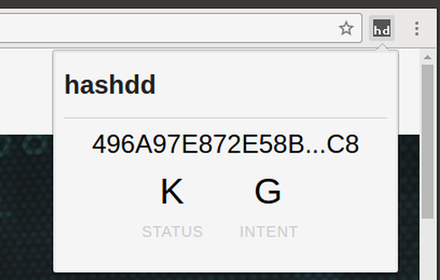 We've built a browser extension so that you can use the hashdd.com API to identify if the file is known good or bad. Once your download completes, click the hashdd extension icon, then drag and drop the download into the analyze field. 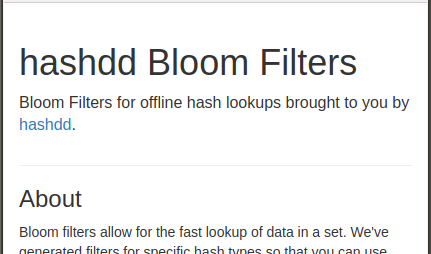 Our Bloom Filters allow of super fast offline lookups and are built using popular open source libraries. This enables you to include hashdd data in your own applications! Want hashdd features in the comfort of your own channel? Add the hashdd slash command for quick lookups. Registered users with third party API keys defined also see results from those integrations! The API provides an easy way to interact with hashdd. Some API access requires an key, but don't worry, keys are free! Just click Sign In to get one! You can search which feeds and entries are associated with a given hash, domain, IP or URL. This endpoint doesn't require a key, but is rate limited. You can pull entries for any feed via the /e/<user>/<feed>/get endpoint. In this example hashdd is the user, testfeed is the feed. This returns the last 100 entries. Requires API Key. Share new observables via the /e/<user>/<feed> endpoint. 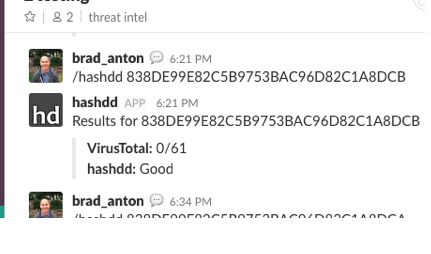 In this example hashdd is the user, testfeed is the feed. Defanged URLs, IPs, and domains are processed as indicators, leading carets (^) designate evidence, # designate tags, fanged URLs are references, and -- are for comments. By default, hashdd will return the status of a given hash. To lookup only NSRL RDS hashes, query /nsrl. To get full detail on a hash, including NSRL, query /detail.